Many websites and services use Google Analytics to track user interaction (we don't). The data provides webmasters with a wealth of information, from keywords that users entered into search engines over time spend on site to language, resolution, browser and operating system information. Internet users who take a look at the cookies database of their web browser will notice many Google Analytics cookies listed here. These cookies, according to Google, are used to define user sessions and provide "a number of key features" in the Google Analytics report. GA Cookie Cruncher is a free program for the Windows operating system that you can use to analyze these cookies on your system. You will end up with a list of sites that were visited in a particular browser plus other information that you may find useful. The program is fully portable and can be run right after download and extraction on the local system. 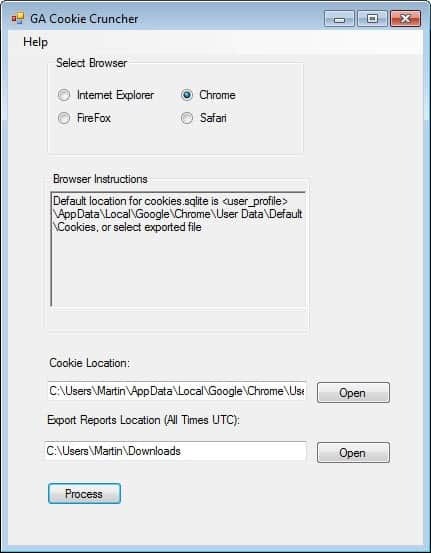 You then need to select one of the supported browsers at the top, that is Internet Explorer, Chrome, Firefox or Safari, take notice of the browser instructions below to add the cookie location manually below. An automated option would be helpful here as it is not always as some instructions need some work done to be accurate. The Chrome instructions read for instance that you find the cookies.sqlite file under appdate\local\Google\Chrome\User Data\Default\Cookies. On my system, they were listed in the default directory. GA Cookie Cruncher processes the cookies then and saves csv files to the selected reporting directory. A total of three different cookie files, _utma, _utmb and _utmz are saved by the program. These types of cookies contain different information. The _utmz cookie type records for instance where a visitor came from. The date displayed in the table reveals information such as the last access date, when the cookie was created, how many times a site has been visited, or how you were referred to the site. It is definitely interesting to see which information Google Analytics cookies store on your system and how many of the sites you visit use these cookies to track your use of the site. This sounds like a good idea, especially if you have kids that access the internet .